The Hideaway is a gorgeous six-bedroom vacation home with four and a half bathrooms, so there’s plenty of space to spread out and relax. Entertaining is easy with an open kitchen and ample storage, plus a second floor loft ideal for a game room or guest bedroom. The first floor Owner’s Suite offers privacy and space, with a generous storage area. This plan also includes a 2-car garage. 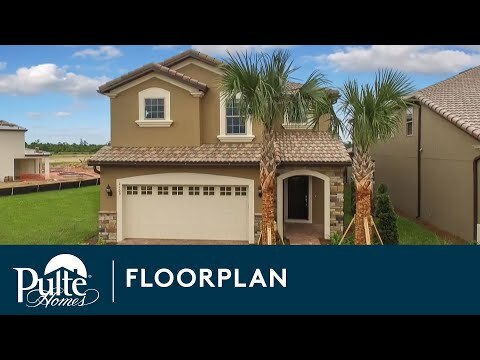 The six-bedroom Hideaway vacation home, by Pulte, is known for its dual suites--one on the first floor and one on the second. Each floor also features a living area for entertaining. Entertain and relax in the large lanai, which includes storage space. This home also features a 2-car garage and tile floors. The six-bedroom Hideaway vacation home is known for its dual suites--one on the first floor and one on the second. Each floor also features a living area for entertaining. Entertain and relax in the large lanai, which includes storage space.